“I was flashing a mod to change my phone’s dialer and contacts apps, but in the process my Contacts were wiped. I never backed up my contacts to Google nor have I taken any kind of backup (otherwise I wouldn’t ask here)… Is there any way I can recover or un-delete my contacts? Hope that you don’t have the same trouble as the phone user does in the above example because losing contacts can be a very disturbing matter, especially when you have never done backup for it. 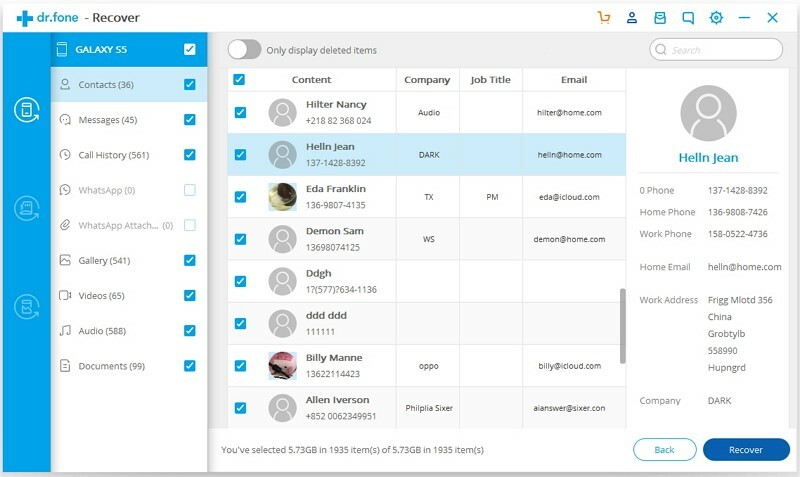 However, don’t be upset when it does happen on you, for here are two practical methods for you to restore the deleted contacts, accidentally or not. Note that do not use your phone once you are to retrieve those phone numbers, just in case of overwriting. It would be possible for you to recover deleted contacts based on the synchronization between your Android device and a specific Google account. Please follow the instruction below to get your important contacts back! 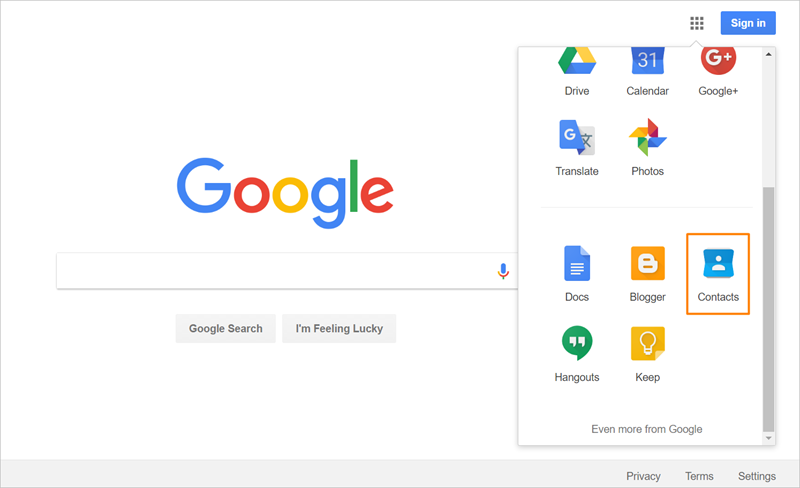 Step 1: Go to Google Contacts in your computer browser. 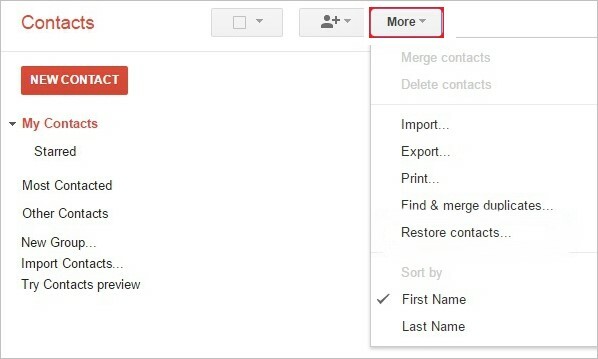 Step 2: On the upper middle of the interface, in the pull-down menu of “More”, scroll down to click on “Restore contacts”. 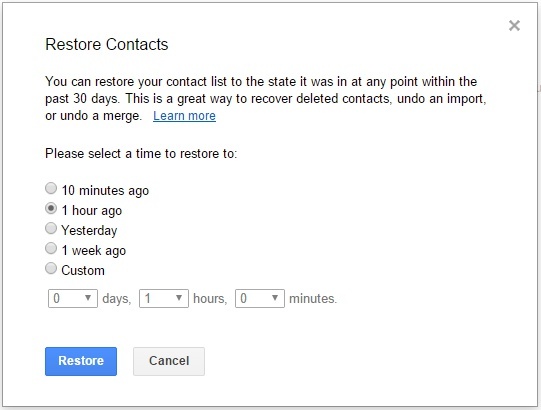 Step 3: In the next pop-up window, you are going to select a time to restore the contacts. Note that contacts can only be recovered within the latest 30 days. Tap on “Restore” and the operation is finished. 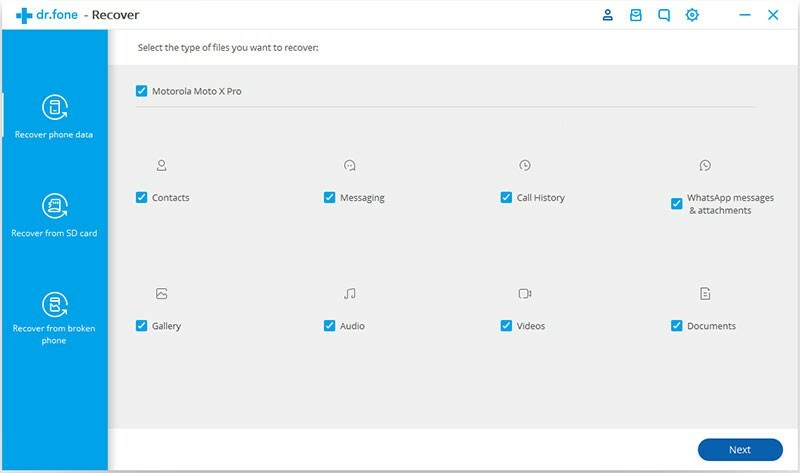 Step 1: Launch the software and choose the “Recover” option. Then connect your Android phone to your computer with a USB cable (do USB debugging when it is required). Step 2: In this case, among all those optional file types, tick on “Contacts” and click on the “Next” button. 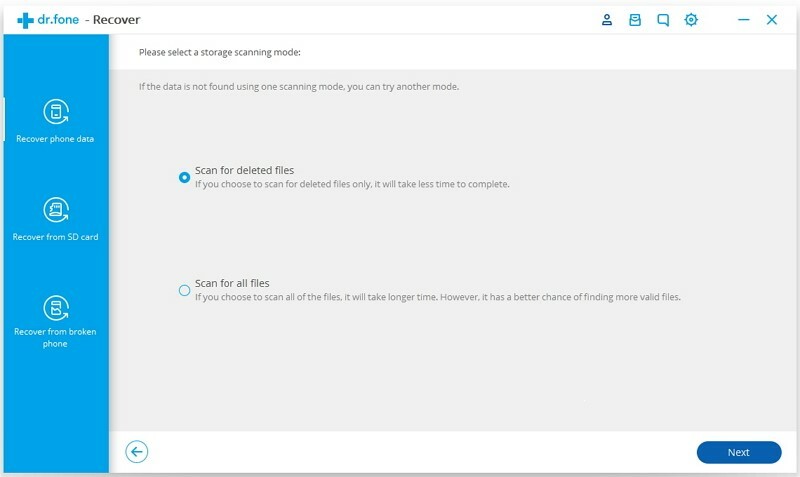 Step 3: The software provides two scanning modes: “Standard Mode” and “Advanced Mode”, it’s better to choose the former one first, for it takes shorter and does not void your device warranty. If it cannot find the contacts that you want, then turn to the latter one. Step 4: Wait for the scan complete, check the contacts file that can be recovered and that you intend to recover. Maybe you can tap on the “Display deleted files only” button and get a quicker result. 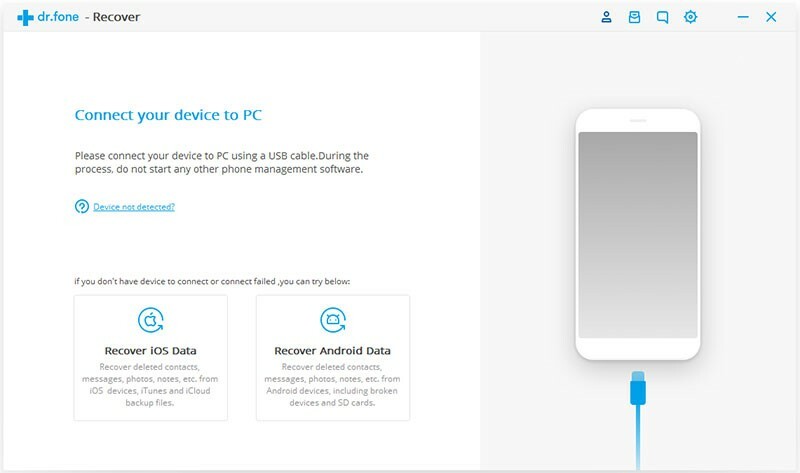 Finally, click on the “Recover” button to save them on your computer. Done. Note: The restored contacts is saved on your PC in vCard format. You can import the contacts back to your phone, copy the vCard document to your Android first, then follow this instruction: “Settings > Contacts > Import/Export contacts > Import from device storage”. On dealing with the losing contacts issue, transfer them from one SIM card to another will be a great choice. Step 1: Go to “Contacts” and click on “More”, then choose “Settings”. Step 2: Tap on “Import/Export contacts”, then “Export to device storage”, selecting the target contacts from the list, and tap on “OK ” to confirm export. Interpersonal communication is such an essentially social activity in modern life, which partly rely on the contact lists on everyone’s phone. Therefore, it is of great importance to preserve them well and let’s form the habit of backing them up regularly!